Consumer lending has a reputation for being paper-intensive, and many borrowers dread the mounds of paper forms awaiting their signature. But technology and new legislation are changing both the customer experience and operational efficiency with paperless processes, digital signatures, mobile capabilities and back-office automation and compliance. 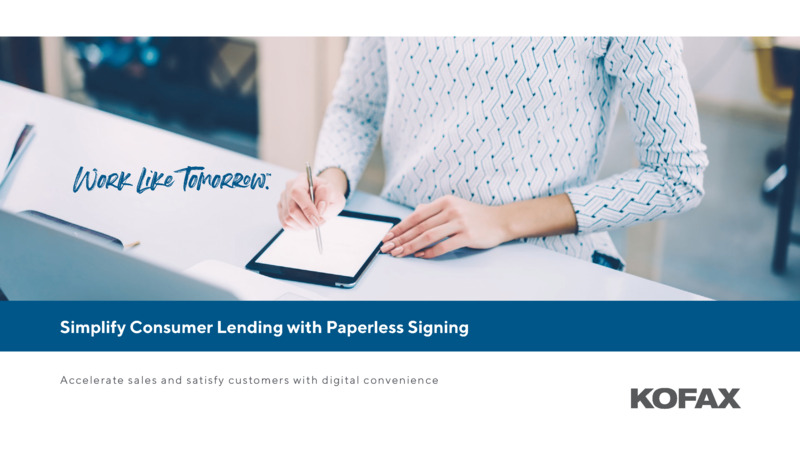 Revolutionize your antiquated, paper-laden traditional lending process with a solution that streamlines loan processing, provides proactive, omnichannel assistance and communication to customers and avoids costly follow-up loops. Not only will you originate and close loans faster and with greater efficiency, compliance and security, but you’ll elevate your customers’ experience to a new level of long-term value. Save time, money and errors with customer self service and faster, more accurate processing on an integrated platform. Stand out from the competition with a simple and secure paperless loan process that creates loyal customers. Create an audit trail for data and signatures, prevent fraud and ensure bank-level security for data in transit and at rest. Eliminate manual labor and significantly reduce paper costs while increasing speed of processing. What sets Spotcap apart from a typical credit provider is the efficient way we can turn around a loan offer, and the RPA capabilities that Kapow delivers are key to enabling our quick and efficient service. When you automate, simplify and speed up loan applications and closing, you deliver an exceptional consumer lending experience that cultivates customer loyalty, saves time and money and differentiates your service from the competition. Power your lending processes. Empower your customers.